When I first laid eyes upon the set of teaser posters for Denis Villeneuve’s sci-fi brainer Arrival I was immediately struck in awe. It happens rarely that I fall in love with a film poster at first sight, but I just lost myself in those amazing still-lives with their gorgeous colours and lighting. So much so that I could even ignore some of the choppy Photoshop actions in there. Furthermore BLT Communications, widely regarded as a leading player in the business, got into hot water with a quite controversial faux pas, but not even that stopped me from totally going into raptures. Excitedly I added Arrival to my fall schedule and waited for some textless posters or key art to be released. But except for a few character posters (#14, #15), Paramount never put out any more promotional material. Week after week I was looking out for something useful, but no such luck. The thought that somewhere, some graphics designer had all those unprocessed source images sitting on his workstation drove me nuts. So I opted for the more difficult path, even if it meant I had to do everything manually, just like in the old days. After a rather simple first task of removing all text elements by hand, my main concern was the typical portrait poster format. Somehow I had to extend it in width without loosing the monumental appearances of the alien ships. It was kind of a revelatory moment when I realized I could cut out the ships from the background and fill the remaining area with the help of Photoshop’s intelligent algorithms. This would also allow me to crop the posters down to a square and resize/reposition each ship to maintain the overall image composition. Said and done. It more or less worked like magic! There were some particular tricky ones which needed further work, for instance the addition of some atmospheric haze and clouds to fix minor scale issues. But overall it payed off nicely. Due to popular demand I also tried to include some artworks featuring actual human beings. 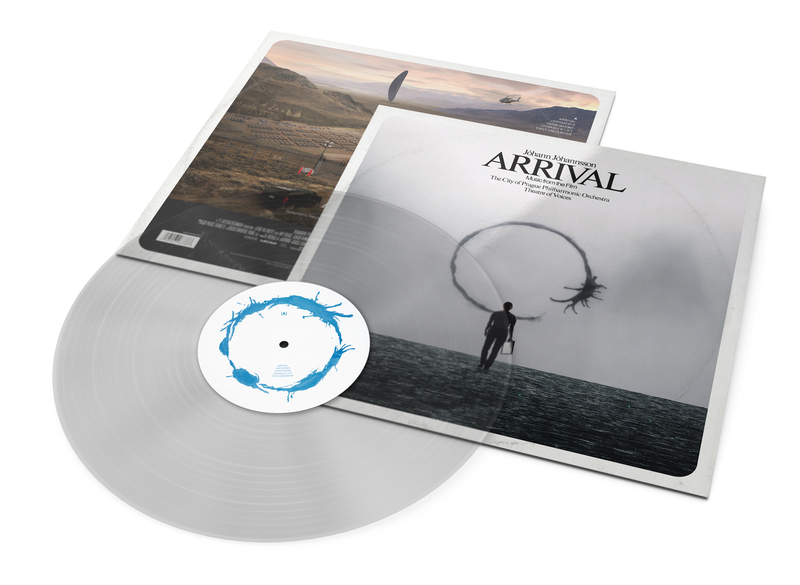 I haven’t seen the film yet and only listened to bits from the score, but Arrival is already among 2016’s favourites for me. Denis Villeneuve’s track record so far is flawless and Jóhann Jóhannsson is for sure one of the most interesting and creative composers working today. The film itself is lauded as the most intelligent yet equally entertaining science fiction film in years. A statement that only seems to be supported by those twelve beautifully crafted scenes of seemingly random alien spacecraft landing sites. A stylish combination of understatement and attention to detail that, at least for me, captures everything Arrival is supposed to and apparently will be. By dismantling the original posters I was left with perfectly cut out spacecraft PNGs. So I decided to take an extra turn around this score. The custom covers below are all based on the beautiful landscapes, mountains, lakes and rivers of my home country Austria (plus a particular one from Prague, which I made upon request). It was a fun thing to add those massive UFOs to various regions I’ve already visited for real. But it also made me realize that I’m absolutely no Photoshop guru. Creating custom covers on already polished pre-existing material is one thing, but editing and photoshopping regular photos and make them look good and “real” is a completely different thing. Not mine necessarily. Once again I’ve re-visited this covers series at request for an old-fashioned Vinyl design, like I used to make plenty in the past. And it was surprisingly satisfying to work on this viually rich film score again. I’ve had some unused source images in stock and figured one of them might work well on the front (#24) of a Vinyl jacket. For the back (#25) I’ve had a pretty clear picture of how I wanted it to look like as well. The beautiful landscape shot is a concept artwork by Meinert Hansen. This Vinyl Edition went through quite a lot iterations, from a plain textless front over a sort-of solo album art and into the old-fashioned font design I considered as final. I guess sometimes it’s best to stick with established looks, especially when explicitly asked. I also wanted to contrast the ultra-minimalistic cover from the official Vinyl, so a little retro font design was the right way to go. But I’m sure that my custom cover would look particularly less retroesque if it was meant to be a modern release. The final Deutsche Grammophon version (#26) was a by-product that just happened along the way, and left me wondering why it didn’t occur to me any sooner. Thank you for these covers! As soon as I watched this movie, I had to get the score for this. The sound design and score used in this movie is brilliant. I was disappointed in the official cover of this score because it was just so uninteresting, especially considering the visual brilliance of the movie itself. I love the changes you made to the covers and the different locations used. Hopefully more images from the movie come out in the future so you can revisit it because the movie just looks stunning. Thanks for the great work!!! I really cannot wait any longer for this film to arrive in our local cinema. The soundtracl album is utterly amazing, I’m spinning it daily. You know… I think the original cover looks quite fine, bar the DG logo. But with so many beautiful images available, it’s hard to pick a favourite. Yeah I like the original too- its visually understated like the film itself. Quite like some of your variants too but the original is fine. Maybe you could do a retro variant like you used to? That might be intetesting. Cheers, I look forward to seeing what you come up with. I’m absolutely in love with this! Maybe it’s just me, but it feels similar to The Revenant… Slow, haunting, a work of art. A question for you, have you heard the soundtrack to ‘The Last Guardian’? I’m sure you’ll love it, it’s magnificent and beautiful. You should give it a try, especially the third track ‘Forest’, my favorite of the whole album. I’m totally with you. I’m more and more attracted to ambient scores like this one. And funny that you mention it, but I’ve been thinking about a custom covers series for The Last Guardian for a while now. I haven’t heard the score, but your description sounds promising. And I have wanted to work on a video game score again. Maybe I’ll give it a try if I find some images to work with. Thanks for the hint anyway! Oh that vinyl version- love it. I love the ease of use and permanence of cd but do so miss the larger format and tangible cardboard of those lp covers. Somehow I always prefer these retro designs. Maybe its because they hark back to the 1960s and 1970s designs I grew up with, maybe its just they look so fresh and exciting compared to modern styles and what works on the reduced cd package size. Great work though, thanks for the effort. Version 26 gives me chills! I want that cd! I’m glad you like it! I really have enjoyed that particular evening when I was making those two covers. And I’m appreciating the score even more now after listening to it for a few hours straight.